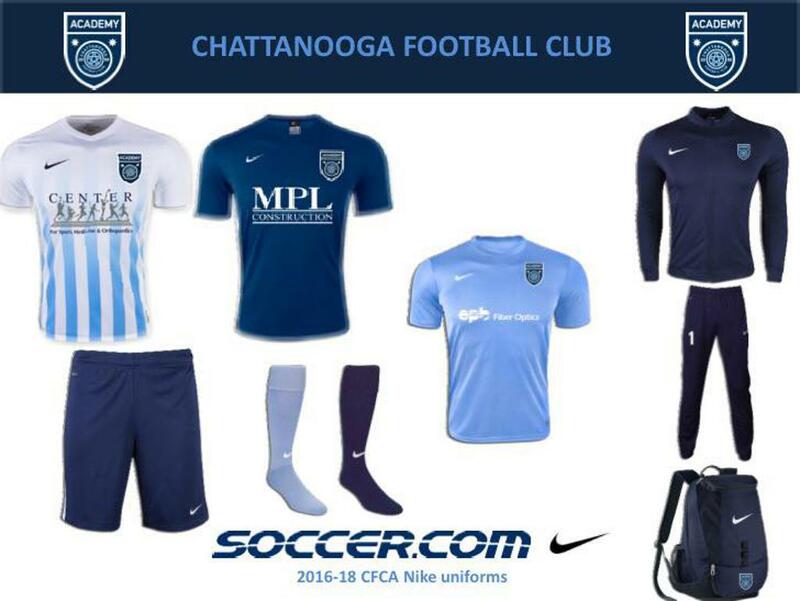 Chattanooga FC Academy has been chosen as a Nike Premier Club beginning with the Fall 2016 season. These uniforms will be used for two complete seasons (Fall 2016- Spring 2018) CFCA is one of a select group of clubs across the country that has been selected by Nike. The partnership means Nike is committed to providing the club with a higher quality level of service to ensure the best possible environment and professional appearance of its players and coaches. Training equipment, uniforms, coaching gear, and access to Nike resources are a major benefit of this relationship. As a member of this elite group of youth soccer clubs, Chattanooga FC Academy upholds the highest level of professionalism and quality and will have many advantages and privileges. Nike will also grant access to brand resources such as Elite 2.0 Training (used by US National Team) as well as opportunities to receive invitations/tickets to US National Team events. As a Nike Premier Club, Chattanooga FC Academy will have the area's exclusive access to Nike's vast resources such as Nike ID camps, coaching support, and education for staff. In addition, CFCA top teams will have preferred access to the top youth soccer tournaments in the United States. These tournaments will give the Club's top athletes exposure to the premier collegiate soccer programs in the country. For many of you, in the next few days, you will be receiving your first email from Soccer.com with a link and instructions on ordering your CFCA Nike uniforms. There is always a possibility that the email will be delivered to your spam folder, so please keep an eye on that. If you have already received this information, please do not wait to place your order! For several custom items, delivery can take up to 4 weeks. A note for the girls teams when they go to order: You will be presented two of each jersey (youth cut, and women’s cut) and same for the shorts. The system will automatically put 1 of each item into your cart and you just have to choose a size- we’ll have some players that order an adult jersey and youth shorts (so all options have to be presented). However, the parents will need to ZERO out the extra items they don’t need. For example, if I need women’s AS jerseys – I will ZERO out the youth jersey, etc.